On July 19, 2017, my 18 year-old daughter, Delaney, died. It was sudden and unexpected and unexplained. Sometime during that night, for no apparent reason her heart stopped. After months of investigation, we were left with the unsatisfying moniker of “Sudden Unknown Death in Children (SUDC)” as the only cause. But this piece isn’t about those terrible hours, days, and weeks that followed her death. I’m a writer and a teacher. And I have a story to tell: about the telling of her story. Delaney was a scholar and a learner, with an inquisitive mind and an always-positive demeanor. She was a storyteller and learning was her passion. I think she’d approve. Just before she died, she came home for the weekend; we ran together and chatted about the future: her plans, her research, her work. We told jokes and laughed as I doubled-back for our slow-moving dog. That evening, I lingered in our driveway and watched and waved as she drove back to her college. I worried about her drive and hoped she would get there before dark. Only a few days later, I was at a funeral home. I was handed a questionnaire that asked me to provide details about Delaney’s life so some anonymous staff person could write her obituary. No, This ‘Life Story’ was not going to be from a writing template. And it was not going to be written by a stranger. In a haze of sorrow, shock, fear, and feelings of despair whose depth I can’t even begin to describe, I wrote her story. I remembered; I thought; I talked. I cried. I laughed. I revised. And I had a deadline: two short, awful days. I approached the task as I would any other one. I had a goal, an audience, and a purpose. I studied the genre of the obituary: I learned the tones, styles, and brushstrokes of telling life stories for a public audience. I’ve written high-stakes genres before, often under pressure: press releases, speeches on behalf of military dignitaries; press conferences in a wartime theatre; I’ve written about death and destruction; I’ve also written newsletters, and articles, and editorials – and memos, reports, and responses to people who didn’t want to hear what I needed to say. I thought I knew about high-stakes writing. But, writing for me is professional; I’ve never written anything so personal. I wrote: I told stories; I shared remembrances; I described traits. The finished piece helped start conversations and connections. I saw people read my work and laugh and cry. Story in hand, they talked and joked; they remembered and reminisced. They started conversations with strangers. They thought of things past. They told anecdotes. A priest told a crowd of hundreds that the story captured Delaney’s spirit. It was read far and wide, introducing her to thousands of people she never knew. It’s still being seen online, with a rolling clicker of views, and comments, and testimonials. But I also missed too much. I couldn’t capture her complexity. her charm. her wit and humor; her desire to someday go to space. I also made smaller mistakes: misspelling her faculty mentor’s name, misstating where she backpacked over Spring Break. An early draft totally ignored her commitment to our faith. I talked too much about our shared loves: running, hiking, skiing, sailing, research methods — and not enough about her other passions – her friends, dancing, singing, music … selfies. I fell into lazy cliches. I didn’t research or inquire of others. The story I told was almost exclusively from my perspective. Delaney was always dedicated to finding opportunities to learn in any situation. In that spirit, here are some personal and professional insights I take forward from this experience. Writing can be healing. There was nothing remotely joyful about writing her story, but it helped me get through those awful days. The obsession with the writing and revising task kept me together. It gave me a mission and a plan in a task that I was expert in. It was a gift to help tell her story and hear stories in return. I understand the emotional power of writing better now. Personal and professional writing are not always exclusive. I’ve always separated what I do – reach audiences for real, tangible purposes from emotional, personal writing. I wrote a personal document in a professional genre. I used my professional writing skills to assist in a personal writing task. And I used my emotions and feelings to drive the task. I no longer see such a distinction. Collaboration matters. I wrote, but I didn’t invite others to participate. This created blind spots and omissions, both of tone and fact. Even in tasks like this, writers need a community of sharing and learning. My mistakes were mostly omissions, because I didn’t talk to others. Instead of retreating into my task, I should have engaged with others. Stories evolve and grow. My professional writing tasks always come with an end; once the work is finished, I’m done. But this story constantly grows with each new person I meet, and each new anecdote I learn. I’ve also written more for myself – in hotel rooms, after runs, and on planes, in verse and haiku, and more. 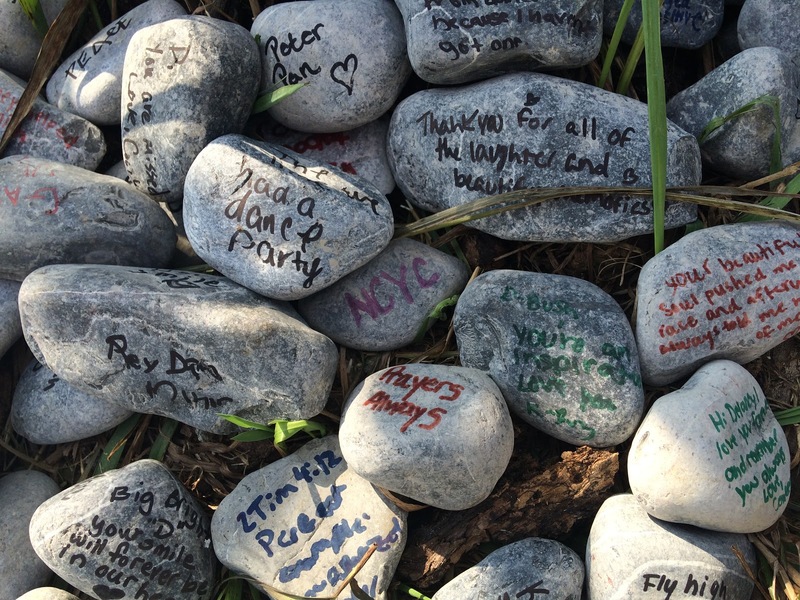 People have shared stories about her online, in person, written on rocks, in prayers and songs, and letters and on and on. The story and storytelling continues. And, finally — Authenticity, Reciprocity, and Sharing matter. Throughout my career, I think I’ve been guilty of being inauthentic with my students. I’ve had students write authentically and deeply in class, but I haven’t often reciprocated equally, if at all. But this semester, my students were sharing deeply-held feelings, beliefs, and experiences – sometimes painful ones — during a ‘This I Believe’ video project. I realized that their honesty deserved mine as well, and I wrote a piece to share with them about Delaney. That video – about storytelling – was the genesis of this piece. I think my teaching is richer as a result. This is yet another gift she has given me. I certainly don’t own grief. Loss is universal, but I hope my sharing of this story and the writing process involved helps other teachers think through their own writing and teaching in the aftermath of loss. Looking critically at a writing task and considering its implications makes us all better teachers and writers. I also hope readers take the time to read about Delaney and remember their love of writing, learning, and teaching — because that’s just the type of thing she would want. Jonathan Bush is a professor of English at Western Michigan University, where he also directs the Third Coast Writing Project. Author’s note: I wish to thank my wife, Erin, for encouraging me to write this piece, and for being my role model in helping our family learn and grow, to the colleagues and friends who read early drafts, and to Writers Who Care, for helping to craft this piece and for providing this unique and important place for sharing. ← Advice to Teachers: What Do Young People Have to Say About Writing? A beautiful post. My heart goes out to you. Beautiful, Jonathan…My heart continues to break for all of you. But I will use this post with my students as they think about the power of writing. Thank you. You gave me the honor of reading this before it was published. I have already used the advice with both my 8th graders and my college students. It is from my perspective as I watched her journey through a grief she had never known. It’s rough still, but if you’d like I can share it with you. My experience in writing my daughter’s obituary was similar to yours. I’m certain I missed some things, but in Erica’s 29 years, she’d done a lot of living. And again, it was only from my point of view. I’ve heard so much about Delaney, she must have been a wonderful young woman. I love you guys, JB. Yours is such a strong, funny, happy family, even with such a large piece missing. That achievement speaks so much for you and Erin, as well as all four kids. Thank you for writing this moving post. I appreciate your courage, vulnerabilities and teaching.